"In this last edition of Volume I, van der Krogt 41:1.1 (1640), the preliminary section is reduced to Braun's forward and the Hittorp letter. The London map/view is not present and instead is found at the beginning of Volume V. The Civitates Orbis Terrarum was the first atlas of world cities and one of the most important books published in the late 16th century. Although led by Braun and Hogenberg, the books were created by a large team of writers, engravers, and artists. R.V. 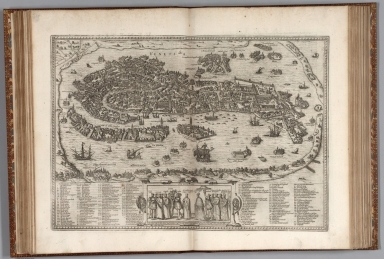 Tooley writes: ""The Civitates is one of the great books of the World... it was the first serious attempt to give graphic representations of the main cities of the World, with a wealth of factual detail. In the main, the buildings in each view are shown in elevation, and while the ordinary buildings are stylized, the principal buildings are reproduced from actual drawings on the spot, and these, and the main streets, can be recognized today. Further, the editors gave additional factual information as a deliberately planned policy, such as the heraldic arms of the city, and the nature of the surrounding countryside, whether wooded or arable, grazing land, vineyards, or gardens. The importance of waterways is stressed by the careful delineation of stone bridges, wooden pontoons, flat-bottomed ferries, moles, wharves and jetties; the ports with ocean-going craft, the inland waters with river traffic. Varieties of land travel are depicted, pedestrians, horsemen, wagons, coaches, and palanquins. Small vignettes illustrate the trade, occupations and habits of the locality, agriculture, paper-making and textiles. The law is represented by various forms of punishment, gibbets, wheels, floggings etc. A distinctive feature of the plates is the insertion of large figures in the foreground to illustrate local costume. Those figures are out of proportion necessarily. The general multiplication of detail slightly offends certain commentators who fail to appreciate the purpose of the editors. Their primary aim was not to produce well-balanced landscapes, but to give as much information as possible in a pleasing visual form, in reality a kind of super guide book. This was done so magnificently that the result was an art as decorative as it was informative. The whole forms a wonderful compendium of life in Europe in the sixteenth century. And as city growth in early times, with a few obvious exceptions, was more or less static, even further it gives a visual printed record of mediaeval Europe, and is one of the most valuable sources remaining to the student and historian of these periods."" (R.V. Tooley, preface to the reproduction edition of Civitates Orbis Terrarum, World Publishing, 1966)"